Creative Equals and Campaign are calling for female creatives to apply to become a future leader. Entries are open to all rising female professionals in the creative industry, living and working in the UK. Talent can range from wordsmiths, visual artists, bold idea thinkers and experience makers who are redefining creativity now. 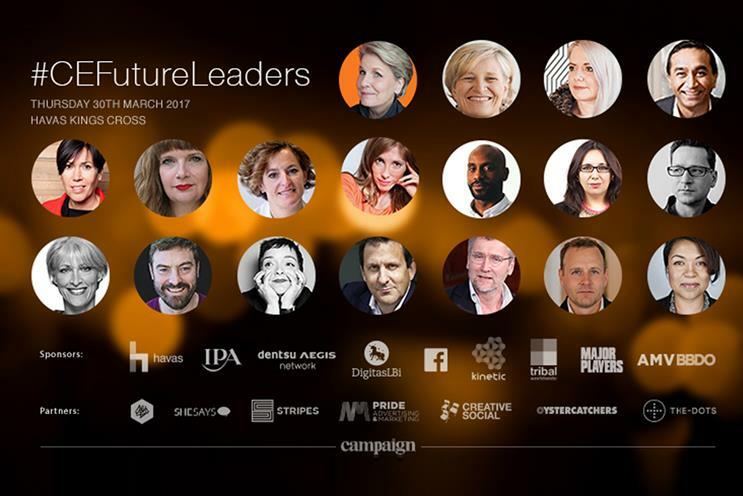 Female creatives can nominate themselves and the 30 winning entrants will be featured in Campaign and have their work displayed at the #CEFutureLeaders evening event on 30 March. The deadline for nominations is 2 March (this Thursday) and entry is free. The link to nominations is here: https://goo.gl/XQh601. In the UK, just 12% of creative directors are women and Creative Equals’ mission is to double the number of creative directors in the country. Participating entries will be considered by a panel of judges that include: Victoria Buchanan, executive creative director, Tribal DDB; Cheyney Robinson, global chief experience officer, Isobar; Caitlin Ryan, executive creative director, Cheil; Ian Heartfield, executive creative director, BBH; Rob Doubal and Laurence Thomson, executive creative directors, McCann London; Emma Perkins, executive creative director, Mullen Lowe; Daniele Fiandaca, co-founder at Creative Social and Token Man.